Megachurch Pastor Claims Jesus Materialized In His Home Wearing A "White Garment" And Had A Chat - Joe.My.God. 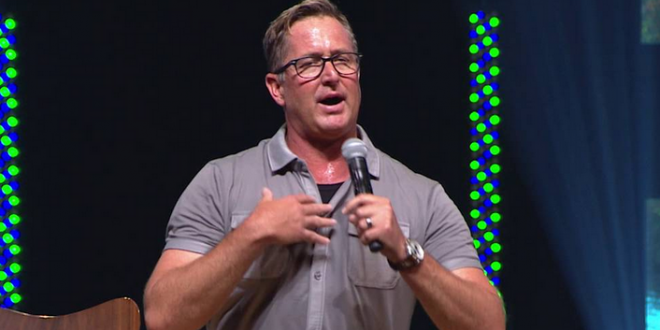 Stovall Weems, senior pastor of the 12,000-member Celebration Church in Jacksonville, Florida, told his congregation Sunday that he met Jesus Christ in his home on Good Friday and was surprised by His personality. “I want to talk to you about the experience I had Friday night where I met and I saw our risen Savior,” Weems said in a recording of his church’s Sunday service posted on YouTube. Why would someone make up such a tale? There are several possible reasons. The first is that the individual may be trying to become a part of the New Apostolic Reformation (NAR), a dangerous charismatic movement that asserts that Apostles still exist today (and seeing the resurrected Christ was a prerequisite for Apostleship, and so NAR leaders all have their personal testimony of having seen Jesus face-to-face). Or, this phenomenon often happens when there is strife or inner-turmoil in the church and the spiritual leader is trying to demonstrate their special status as a messenger of God. Or, a book-deal could be in the works, which is often the case. One thing is for sure, however, Pastor Weems did not see Christ face-to-face. Weems reportedly asked his congregation that he be the first to leave the service so that he wouldn’t have to face any of their questions.